"Using a customized keypad, an “all off” button can shut off all lights, and even lock the doors and set the alarm." "Timers and motion sensors can turn lights on and off automatically, all year long, even adjusting to the season." "Save energy – and money – by setting your lights to 80% during the day, the additional 20% will help you be a little more green." CtrlB offers a full array of elegant lighting options for homes, large or small, whether under construction or hundreds of years old. Accent your home’s design with stylish lighting, make it more energy efficient, safe and secure, and leverage the magic of automation by integrating smart lighting. 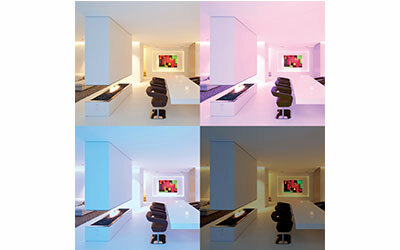 Enjoy the ability to customize and add one-touch lighting scenes whenever the mood strikes, right from a Touch Screen. Turn off all lights in the house while ensuring exterior lights remain on with a press of a “Goodnight” button.